This is an extreme case, but bad motor mounts on older diesels is a very common problem. The previous owner of this diesel Mercedes drove the car so long on collapsed motor mounts that it destroyed the engine. 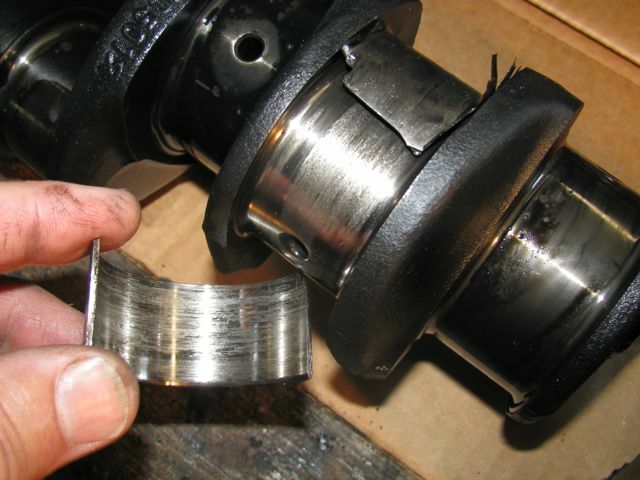 The engine mounts had actually been hitting metal on metal for so long that it compressed and eventually demolished one connecting rod bearing and ruined the crankshaft. Very very expensive mistake for being lazy. They were very disappointed when a shop told them it would be over $6000 to repair! You can imagine the internal negative forces on a diesel engine that is not shock mounted. The moral of the story is don't neglect your rubber motor mounts - especially on diesel engined cars. Here is a close up picture of the connecting rod removed. I have never seen one flattened so badly before. When the motor mounts start to go bad you will feel the extra vibration just sitting in the car and you may hear a clunking sound when you turn the engine off. We carry mounts, tools and instructions so you can replace these yourself and save $$$.